You have made a conscious decision to prepare fresh, organic foods for your family. You carefully consider each ingredient in the dish, but have you considered the pans you are using to prepare the meal? Typical non stick cookware contains dangerous heavy metals and hormone-disrupting chemicals that can flake off into your food during the cooking process. Choosing non-toxic cookware is essential for eliminating toxic chemicals from your family’s diet. 1. What Is Safe Non Stick Cookware? Non-toxic cookware is cookware that does not contain heavy metals or harmful chemicals. Most non stick cookware is made using poly and perfluoroalkyl substances (PFAD). When heated, these PFAS release perfluorooctanoic acid (PFOA), which is a carcinogenic chemical. This chemical, and heavy metals, can leach into your food during cooking, exposing your family to potential health risks. This is counterproductive to the goal of organic cooking. 2. What Are the Benefits of Non-Toxic Cookware? The main benefit of non stick cookware is obvious: it allows you to cook foods without adding fat to the pan to keep the food from sticking. Adding oils, butter, or fats to the pan to prevent sticking increases the calories and decreases the nutritional value of your food. This is where non stick cookware that is made with non-toxic materials is helpful. There are health risks associated with the use of traditional non stick coatings, such as Teflon. These coatings release toxic, carcinogenic fumes when heated, which is dangerous for the cook, and the people eating the food. 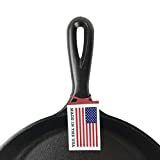 A 2018 study showed a link between cooking with traditional non stick cookware made with Teflon and weight gain. 3. What Materials Are Used in Non-Toxic Cookware? When purchasing non stick cookware, there are some important factors to consider making sure you aren’t accidentally introducing toxic chemicals to the dinner menu. There is non stick cookware made with safe, non-toxic materials and other types of non-stick coatings that should be avoided. There are some great options for non stick cookware that are safer, and not much more expensive, than some of the harmful materials traditionally used for non stick surfaces. Some safer materials for non stick cookware include carbon steel, porcelain enamel, ceramic, lava rock, and tempered glass. Many people use cast iron and stainless steel to avoid traditional non-stick coatings. Stainless steel and cast iron safe, and definitely safer than Teflon coated pans. However, these metal pans can leach heavy metals, iron from cast iron and nickel from stainless steel pans. It is best to avoid Teflon and aluminum, as both contain potential risks due to the leaching of toxins and hormone-disrupting chemicals into your food. Teflon pans are coated with polytetrafluoroethylene (PTFE). When heated, this coating produces toxic perfluorooctanoic acid (PFOA), which is a carcinogenic chemical that leaches into the food and creates fumes that are inhaled by the person doing the cooking. Research has liked elevated levels of aluminum with central nervous system conditions. 2013 study published in Immunologic Research showed a link between aluminum levels and ALS, Alzheimer’s disease, and autism spectrum disorders. 4. Where Can You Buy Non-Toxic Non Stick Cookware? The brands discussed in this article can be found in stores, on Amazon, and other online retailers. 5. What Types of Cookware Are Best for the Stove or Oven? Non stick cookware is available for use on the cooktop and in the oven. Not every type of material is suitable for both. For example, cast iron pans can be used in either the oven or on the stovetop. However, glass pans and some ceramic casserole dishes are suitable for baking in the oven, but not meant to be used on a cooktop. Always consider how you will use the cookware when making a purchasing decision. A mix of pots and pans in different materials may be best for your specific needs and cooking preferences. 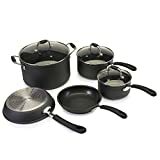 In putting together this list, we invested time and effort in researching different materials, brands, and types of products to provide an unbiased and extensive list of the best non-toxic non stick cookware for your kitchen. We reviewed products based on the features, pros and cons of each, price range, where to buy, and the warranties offered by the companies. 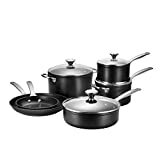 Non-toxic non stick cookware differs in price. 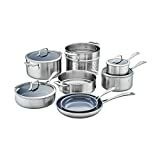 The prices for individual pans range from $20 to $100, depending on the brand. For a set, prices range from $150 to $500 or more. There is a quality product for every budget. Zwilling cookware is manufactured by J.A. Henckels, a German company that is well known for making high-end kitchen knives and high-quality ceramic non stick cookware that caters to discerning cooks and professional chefs. Their Ceraforce Ultra coated cookware is durable, easy to clean, heats evenly, and holds in the flavor of your foods. Zwilling cookware is available on Amazon, in stores, and through other online retailers. It is among the more expensive brands, but they can often be found on sale. Ecolution non stick cookware is made without PFOA. These aluminum bottomed pots and pans heat evenly without leaching toxic chemicals or heavy metals into your food. The coating is water-based, rather than using a questionable solvent. Ecolution cookware is sold individually and in sets. This allows you to replace one pot or pan at a time if you prefer not to invest in a completely new set all at once. Ecolution products are sold in stores, on Amazon, and other online stores. Cast-iron pans have been popular among cooks for generations. Although they are heavy, cast iron cookware continues to have an honored place in many kitchens and a new generation of cooks have embraced this timeless classic. Cast iron can leach iron into the food, but some people like the extra iron in their diets. One downside of cast iron for some people is the need to season the pan before use. Lodge cast-iron pans come pre-seasoned for easy use. 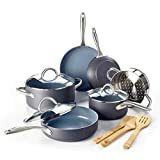 This unique non stick cookware is available in skillets, grill pans, casserole dishes, and Dutch ovens. These pans have stainless steel handles, so they can easily be transferred from the cooktop to the oven. Cast iron cannot be scrubbed with a steel wool pad or other abrasive cleaner. Avoid cooking tomato-based foods in any cast iron pan because the acid interacts with the pH in the pan and negatively affects the flavor of your food. Lodge cast iron pans can be found on Amazon and many online and brick and mortar stores. This high-end brand of non-toxic non stick cookware is manufactured in Belgium. GreenPan is coated with a ceramic non-stick layer, called Thermolon. Thermolon is derived from sand and minerals, so it contains no PFAS, PFOA, lead, or cadmium. The company continually works to improve their non stick cookware with each new product. The Valencia Pro line from this brand features Magneto technology for efficient and even cooking on an induction cooktop. The company uses environmentally sustainable production methods, which require less than half the energy used to make traditional non stick cookware. GreenPan products can be found online through Amazon and in stores. Cuisinart Green Gourmet uses a ceramic-based surface in this non stick cookware, known as Ceramica. The ceramic coating contains no PFOA or PTFE. This cookware achieves better heat conductivity, compared with other types of non stick cookware. This saves energy and heats the food more evenly. Look for Cuisinart Green Gourmet on Amazon or in stores and online retailers where quality cookware is sold. This Danish non stick cookware brand has a Green Tek surface. Green Tek is a proprietary ceramic titanium coating that contains no PFOS or PFOA. This cookware is made with recycled pressure cast aluminum, which provides better heat retention and distribution. This brand has been a popular choice in non-stick pans among avid cooks for years. ScanPan can be found in Amazon, online, and in home stores. Le Creuset cast-iron pans offer the heat distribution, durability, and other benefits of cast iron. What makes this non stick cookware unique is the porcelain enamel coating, which allows for easier cleaning. The cast iron skillets from Le Creuset are available in a variety of colors to match any kitchen with a satin black enamel cook surface. The pans develop a natural patina as you cook with them. As with all cast-iron pans, the searing and frying qualities of the pans improve with time. The surface if this non stick cookware allows you to cook any foods without worrying about sticking. You can find Le Creuset cast-iron pans on Amazon and in stores. This non stick cookware contains Greblon, which is a German non-stick coating. The coating is ceramic based and contains no PFOA and PTFE. The company makes the lime green colored Green Earth pans and a line of Stone Earth non stick cookware, which is made with a non-stick coating that is derived from stone and free of harmful chemicals. Ozeri offers cookware with either a smooth or textured cooking surface. This cookware is easy to use on many ranges, including electric, gas, and induction. Ozeri Green Earth cookware is sold on Amazon, in stores, and online. 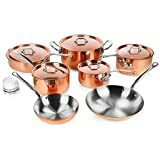 This copper and stainless steel non stick cookware offers the exceptional heat conduction of copper with stainless steel coating to prevent the metal from leaching. This cookware is very responsive to temperature changes. When you turn the burner down to prevent burning, you can rely on the pans to adjust quickly to the change in temperature. Use wooden utensils with this non stick cookware to avoid scratching the stainless steel, which could cause leaching. Shop for Mauviel M’150 cookware in stores or online from Amazon and other retailers. Eco-Logic non stick cookware from Beka is designed with a non-toxic coating safe for your family and environmentally friendly. 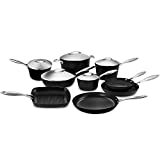 The Eco-Logic product line contains a wide variety of cookware, including frying pans, skillets, and woks, and ladles, spatulas, colanders, and other kitchen tools. This cookware heat evenly on gas, electric, and induction ranges. The skillets are deep enough to make one-dish meals and the handle doesn’t get hot. You can find Beka Eco-Logic products in stores and online from Amazon and other retailers.